Looking for a private place for a small wedding? Consider Wild West Retreat! Where you and your family will enjoy one of the most unique settings for a wedding in Southern Utah. Visit the Photo Gallery (below) and see for yourself the many possibilities. The walkway from the lodge to the stage is perfect for the aisle. The guests are comfortable in the chairs and on the benches that surround the stage and the food is presented buffet style. 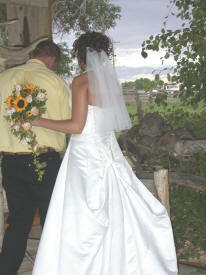 Call Jenifer today and talk with her about your wedding plans. You'll be surprised at the many partnerships in Escalante that can create a day to remember.